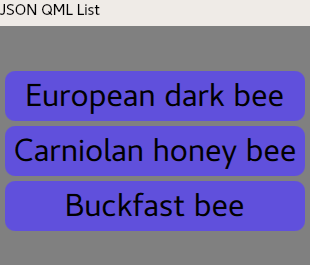 As promised some time ago in “The new QML widgets in QGIS – When widgets get unbridled” we still owe you some fancy unicorns, but first let’s have a look at another nice feature that has been introduced in QGIS 3.4 LTR, the reading of PostgreSQL JSON and JSONB types. With JSON you have a lot of possibilities for storing unstructured data. In our case, it’s mainly interesting when the data are stored as an array or a JSON object. Let’s have a look at two examples. With the usual QGIS widgets “List” and “Key/Value” you are able to display JSON arrays and simple JSON objects. Probably, your JSON data does not look really nice with the aforementioned widgets, luckily since QGIS 3.4, you are free to create your own QML widget. Since QGIS already loads the JSON data into structures that are supported by QML, we can use all the JSON data within the QML code. width: 310; height: 250; color: "grey"
JSON also allows storing more complex data, like for example a list of objects. In that case, you will reach the limits of the common QGIS widgets. Or, even more powerful, you can create your super individual table using the model and create each row by using a QML Repeater. The QML code for that looks like this. I hope you liked reading and you will enjoy using it to make beautiful widgets and forms. If you have questions or inputs, feel free to add a comment.